FAYETTEVILLE, Ark. — Despite a rocky start, the Arkansas cotton harvest appears poised for a record outcome. Overall, the USDA National Agricultural Statistics Service forecasts Arkansas cotton yields at 1.06 million bales in November, up 220,000 bales from a year earlier. That averages to 1,162 pounds of cotton per harvested acre, 87 pounds above 2016. “We’re headed for an all-time record yield on cotton,” said Bill Robertson, extension cotton agronomist for the University of Arkansas System Division of Agriculture. Robertson said heavy rains kept tractors out of the fields during the heart of Arkansas’ cotton planting season from late April through early May. Some growers had their cotton planted before the rains drove them out of the fields, and then those early fields were hit hard by weeks of wet weather. Growers who planted late, after fields dried out, started out behind the calendar, but well-timed late rains gave them a boost, Robertson said. Robertson said cotton yields north of Interstate 40 have been high while yields south of there were average to a little better than average. Despite the soggy start, Arkansas cotton acreage was up in 2017, Robertson said. Growers planted about 440,000 acres of upland cotton, an increase of more than 60,000 acres from 2016. 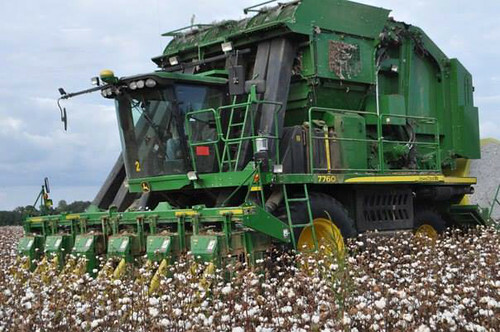 The extra acreage helped boost Arkansas’ cotton harvest. Robertson said cotton also benefitted from lighter disease pressure in 2017. Growers also adapted what they learned from similar weather patterns in 2016, he said, so plants were better managed for fertilizer and pest control. All that cotton will likely have the state’s gins running until about Christmas, Robertson said. Ginning was finished by Dec. 1 in 2016.